The field of DNA sequencing experienced a transformational shift beginning in 2005 with the introduction of the first high-throughput, massively parallel DNA sequencing platform that ushered in the era of “next-generation sequencing.” Initially, next-generation sequencing (NGS) platforms generated millions of bases per instrument run which steadily progressed to the now routine output of billions of bases. 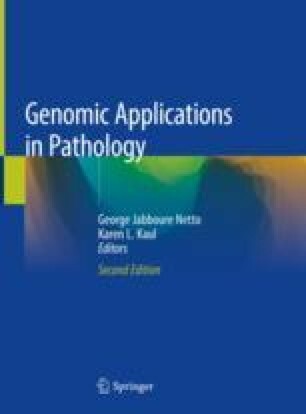 These unprecedented data volumes have driven a renaissance in bioinformatics research and development resulting in a proliferation of open-source and commercial software algorithms to support the computational processing, analysis, and interpretation of NGS results. These efforts have facilitated a broad dissemination of NGS into every facet of biomedical research and into a growing list of clinical diagnostic applications from targeted multigene panels to whole-genome sequencing. NHGRI Sequencing Costs. 2013. http://www.genome.gov/sequencingcosts/. Accessed 20 Feb 2013. Bioinformatics.org wiki. http://www.bioinformatics.org/wiki/Bioinformatics. Accessed 24 Feb 2013. SEQanswers. http://seqanswers.com/. Accessed 12 Feb 2013. Biostar - Bioinformatics Explained. http://www.biostars.org/. Accessed 12 Feb 2013. BioIT-World. http://www.bio-itworld.com/. Accessed 12 Feb 2013. Galaxy NGS server. https://main.g2.bx.psu.edu/. Accessed 12 Feb 2013. NHGRI Short Course on NGS data. http://www.soph.uab.edu/ssg/courses/nhgri_r25. Accessed 12 Feb 2013. AMIA 10x10 Courses. http://www.amia.org/education/10x10-courses. Accessed 12 Feb 2013. Ensembl. http://www.ensembl.org/Homo_sapiens/Info/Index. Accessed 30 May 2017. NCBI Reference genome: Homo sapiens. https://www.ncbi.nlm.nih.gov/genome/?term=homo+sapiens. Accessed 30 May 2017. UCSC Genome Bioinformatics. http://hgdownload.cse.ucsc.edu/downloads.html#human. Accessed 30 May 2017. Burrows-Wheeler Aligner (BWA). http://bio-bwa.sourceforge.net. Accessed 15 Jan 2013. Novoalign. http://www.novocraft.com/main/index.php. Accessed 4 Mar 2013. Genome Analysis Toolkit (GATK). http://www.broadinstitute.org/gatk/. Accessed 4 Mar 2013. SAMtools. http://samtools.sourceforge.net. Accessed 4 Mar 2013. Integrative Genomics Viewer. http://software.broadinstitute.org/software/igv/. Accessed 22 June 2017. Annovar. http://www.openbioinformatics.org/annovar/. Accessed 4 Mar 2013. SnpEff Annotation. http://www.broadinstitute.org/gatk/guide/tagged?tag=snpeff. Accessed 21 Nov 2012. Sorting Intolerant from Tolerant (SIFT). http://sift.jcvi.org/. Accessed 4 Mar 2013. PolyPhen2. http://genetics.bwh.harvard.edu/pph2/. Accessed 25 Feb 2013. Mutation Taster. http://www.mutationtaster.org/index.html. Accessed 6 Dec 2012. Torrent Suite Documentation. http://ioncommunity.lifetechnologies.com/docs/DOC-3343. Accessed 17 Jan 2013. Yandell M, Huff C, Hu H, Singleton M, Moore B, Xing J, Jorde LB, Reese MG. A probabilistic disease-gene finder for personal genomes. Genome Res. doi:gr.123158.111 [pii]. 2011; https://doi.org/10.1101/gr.123158.111. Omicia. http://www.omicia.com/. Accessed 27 Feb 2013. Ingenuity Systems. http://www.ingenuity.com/. Accessed 11 Mar 2013. SV Bio. http://www.svbio.com/. Accessed 26 Feb 2013. Agilent Technologies. http://www.agilent.com/en-us/solutions/clinical-grade-variant-assessment/cartagenia-bench-lab-for-clinical-genetics. Accessed 26 May 2017. Pierian Dx. http://pieriandx.com. Accessed 26 May 2017. Golden Helix Var Seq. http://goldenhelix.com/products/VarSeq/ Accessed 26 May 2017. Pejaver VUJ, Lugo-Martinez J, Pagel KA, Lin GN, Nam H, Mort M, Cooper DN, Sebat J, Iakoucheva LM, Mooney SD, Radivojac P. MutPred2: inferring the molecular and phenotypic impact of amino acid variants. bioRxiv. 2017; https://doi.org/10.1101/134981. Splice Site Tools: A Comparative Analysis Report. http://www.ngrl.org.uk/Manchester/sites/default/files/publications/Informatics/NGRL_Splice_Site_Tools_Analysis_2009.pdf. Accessed 20 June 2017. Interactive Biosoftware Splicing Prediction Module. http://www.interactive-biosoftware.com/doc/alamut-visual/2.9/splicing.html. Accessed 20 June 2017.